The trappers and the “mountain-men of the late 17 and early 1800’s packed this handy device right next to their traps and long rifle. It was sometimes known as a ‘camp buddy’ to the pioneers. By orienting this device one way it’s perfect for hanging your kettle or cooking pots over the fire. Turn it around and you have the perfect thing for cooking those large slabs of meat, toasting, cooking sausages and anything else that can be held on 1 or 2 prongs. 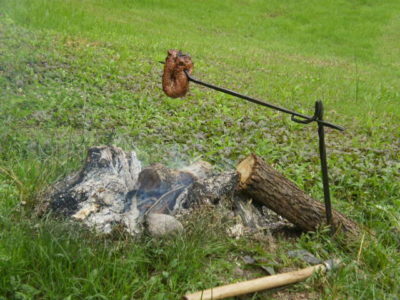 The Single Point Squirrel Cooker is made from 1/4″ square stock and measures about 14″ high and 14″ long. The single point allows for a little easier packing in tight places. This one fits nicely in packs!